Congratulations to Brenna and Caleb on their wedding celebration. Their wedding was selected to be featured within a national publication: Inside Weddings. From the moment we met Brenna and her mom, we knew this event would be a unique Texas wedding. 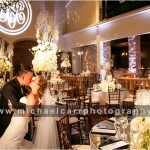 They worked closely with their event planner, Ann Whittington, to pull all the vendors and details together. You can read all about the details of Brenna and Caleb’s wedding in the Fall 2014 issue.